Iron Man is perhaps the most popular character from The Avengers in Japan. It's not just Robert Downey Jr.'s performance as the witty, egomaniac Tony Stark, but the iconic sleek red and gold mechanical suit he dons that make the man of gold-titanium alloy that people love so much. Meet Keiji Yamaguchi. In The Avengers, there are scenes where Robert Downey Jr. puts on and takes off the Iron Man suit (or rather, has the suit put on and taken off) and this is the man we can thank for them. 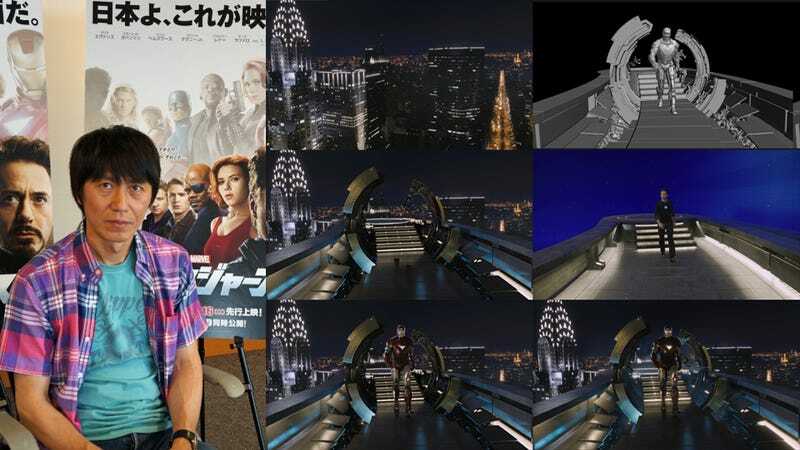 Yamaguchi is a CG creator at Industrial Light & Magic and has such movies under his belt as Iron Man, the Transformers series, and the aforementioned Avengers to name a few, so basically he's one of the go-to guys when it comes to moving CG mechanical parts. Yamaguchi sat down with Kotaku's sister sites, Kotaku Japan and Gizmodo Japan for a couple of interviews on his part in making the automated suit-taker-offer a reality. "I worked like crazy to make that scene what it is." Yamaguchi recalled. "When I first got the assignment, it was a blank slate and neither I nor the people around me had any idea what to do, and then our deadline approached… That's what it was like." "I wasn't Iron Man, I was the Iron Man suit." The use of computer generated effects allows for a great deal of freedom on the part of CG artists like Yamaguchi, but at the same time, the massive amount of freedom can be overwhelming. In order to complete the scene for the Mark VII, Yamaguchi was forced to use data from Iron Man 2. "With the drop scene, there were no storyboards, just the CG model of the capsule and the final suit. Everything in between was up to me." Yamaguchi explained. "There was no time no time to create a mid-transformation model so I had to take apart [the Iron Man 2 data] and rearrange it for the completed scene." Apparently at least 7 suits worth of CG data went into creating the transformation. When creating the Mark VII scene, Yamaguchi recalled thinking about what the experience would actually be like. "I would think in my head, ‘if I jumped from a building, what would the wind resistance feel like?' or ‘how would I position my body if I wanted to stop?' I created the scene as if I was actually doing it myself." When asked if the scene made him Tony Stark putting on the suit as he fell, Yamaguchi replied with a laugh, "I wasn't Iron Man, I was the Iron Man suit." Asked about his influences in creating the CG scenes, Yamaguchi responded that old Japanese anime like Hurricane Polymar and Neo Human Casshern were in his head when working on The Avengers. "I try to put [my respect for such influences] into my work where I can." Yamaguchi said. For scenes with missiles, Yamaguchi utilized an anime technique of chaotic movement of multiple projectiles from Super Dimension Fortress Macross known among fans as the "Itano Circus"
As for working as a CG artist, Yamaguchi noted that it's a line of work that Japanese people may be biologically suited for. "Japanese tend to be very good at detailed work. A lot of Japanese people are both meticulous and are willing to do tiring work without complaint." Yamaguchi remarked. But when it comes down to it, when asked the single most important ingredient in working with CG, Yamaguchi answered "I think focus is probably the most important of all." Keiji Yamaguchi is currently credited for working on the upcoming movie, Pacific Rim. It is unknown whether he will have a hand in Iron Man 3.